Now you can have all of the 180 Days series that correlate to your students’ grade level. These grade level workbooks are available as a collection, and they’re discounted too! This workbook features 180 days of quick, diagnostic-based activities that will allow students to gain and improve their grammar skills. An easy-to-use classroom resource provides students with daily practice in punctuation, capitalization, parts of speech, spelling, and more! This workbook includes data-driven assessment tips, and the activities are correlated to state and national standards. Digital resources include assessment analysis tools and PDFs of the activity sheets. Provide quick and purposeful practice to build mastery with language skills with these daily worksheets. Book includes an answer key and a digital resource CD. Build reading skills and increase the ability to recognize sight words instantly with this invaluable classroom resource. For teachers who do not have time for vocabulary instruction, this series features quick, easy-to-use daily word study activities to include in the language arts block. Based on Fry's 1000 Instant Words, 180 Days of High-Frequency Words introduces three snap words each week in a structure that places the focus on word recognition. A total of 108 high-frequency words are covered. Boost reading, writing, and spelling skills with this workbook that prepares students for college and career. 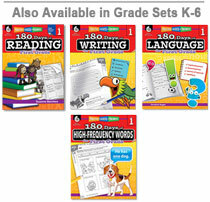 The 180 Day Series workbooks may be purchased in sets by skill area, in sets by grade level, or individually. To purchase individual workbooks, click on the links for different skill areas below in the See Also section.